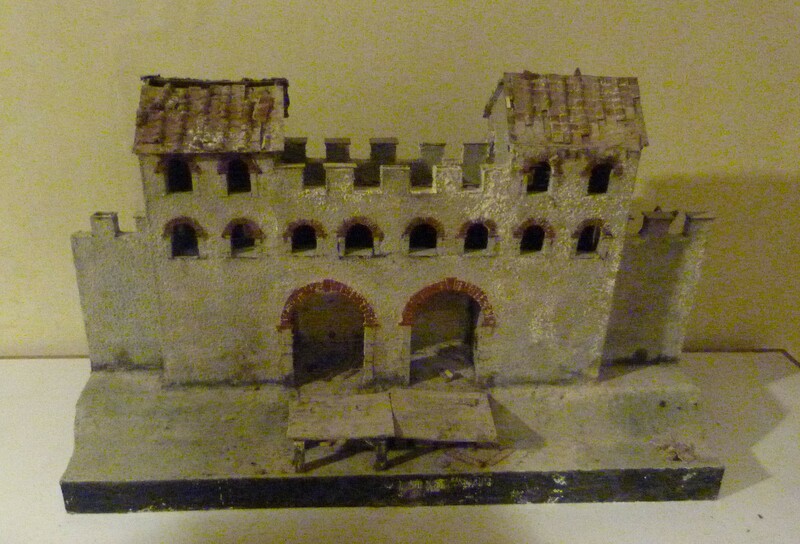 Today (6th May 2014) I attended an excellent – and free – “Gresham Lecture” at the Museum of London. The lecture, appropriately enough, was on “The Gresham Ship”, and was by Gustav Milne of the Museum of London and University College London, a leading authority on the subject (and indeed on the Roman to Medieval Port of London). The – Tudor – ship was discovered in 1846, wrecked, in the Thames Estuary, at a point midway between Southend and Margate, by pioneer divers Charles and John Deane, working out of Whitstable. It is thought to have been outbound from the Port of London, fully laden with a cargo of ingots and bars of various metals, when it sank, possibly after striking a sandbank and losing its rudder. Much of its metal cargo was salvaged in 1846, to be melted down and re-used, under the orders of the then Lord Warden of the Cinque Ports – the Duke of Wellington. Some archaeological artefacts were also recovered at this time, including a silk doublet of Tudor design. The ship was then re-discovered in 2003, during dredging operations preparatory to the construction of the London Gateway Port. Large sections were recovered during subsequent archaeological work, again by divers. Painstaking reassembly on dry land revealed that a substantial part of the forward half of the hull of the vessel had been preserved, although essentially none of the aft. The intact vessel would probably have measured a little over 80’ from bow to stern, and a little under 25’ from side to side, and weighed some 160 tons, making it similar in size to Drake’s Golden Hinde (a reconstruction of which is to be seen in Mary Overie Dock alongside Southwark Cathedral). It was carvel-built, of robust construction, and fitted with gun ports, making it a type known as an “armed merchantman”. Four cannon were recovered during the recent archaeological work (and it is likely that up to eight others were recovered in the nineteenth century). One was an antiquated wrought iron breech-loader, and another a cast iron muzzle-loader, and all were of different sizes and calibres, and took different sizes and calibres of shot. Other metal finds included some surviving ingots of lead and tin, whose isotopic signature indicates a British origin; and some bars of iron, folded over up to four times to save space, of Rhenish origin. Small finds included an ornate salt-cellar, possibly from the Captain’s table; and a pair of leather boots, possibly kicked off by a drowning seaman. 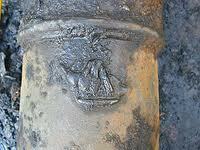 Significantly, one of the cannon recovered from the ship during the recent archaeological work bore the initials T.G., together with the grasshopper insignia of the City merchant Thomas Gresham, which is how came to be known as “The Gresham Ship”. 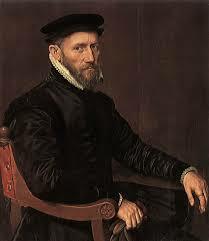 Thomas Gresham lived from 1519-79, founding what was to become known as the Royal Exchange in 1571, and, by bequest, Gresham College in 1597. 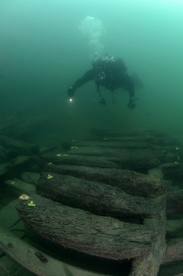 Further evidence for the – precise – age of “The Gresham Ship” has been provided by recent dendrochronological (tree ring) analysis of the ship’s timbers, which has yielded a felling date of 1574. Given what was happening in the Old World – and the New – in the late sixteenth to early seventeenth centuries, the ship is likely to have been involved in some combination of trade, exploration and war. This was the time of the granting of charters to the Muscovy, Eastland, Levant, Barbary, East India and Virginia Companies of Merchant-Adventurers, and the rebuilding of the Custom House; of Drake’s circumnavigation of the globe, and Ralegh and Frobisher’s voyages of discovery; and of the Spanish Armada, and the “privateers”. Thirty-four London ships joined the fight against the Spanish Armada. And seventy became “privateers”, capturing seventy-one foreign ships and their prize cargoes, valued at £100, 000 (at least £15, 000, 000 in today’s terms, according to the National Archives currency convertor). London’s “sea dogs”, sponsored by City merchants, claimed more booty than those of Cornwall, Devon, Bridgwater and Bristol combined! 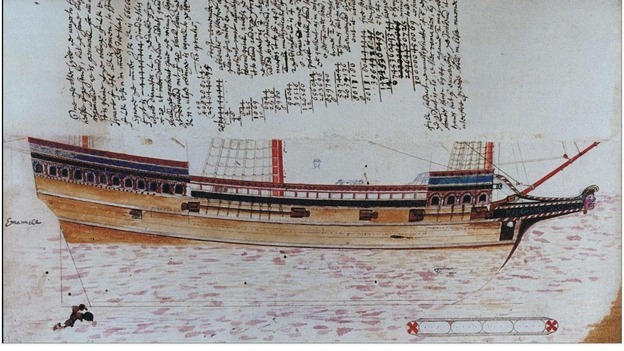 Evidence has recently come to light that suggests that “The Gresham Ship” might actually be the Cherabin, which surviving historical records indicate was owned by the Levant Company between 1590-1600; served under Thomas Howard as a privateer in the Azores in 1591, capturing prize cargoes of sugar, ginger, and suchlike, valued at £2, 000 (at least £300, 000 in today’s terms); and, significantly, sank, in the Kentish Flats, in 1603. The reassembled hull of “The Gresham Ship” – or Cherabin – has recently been relocated to what is essentially an underwater museum at the National Diving Centre at Stoney Cove in Leicestershire, visited by up to 30, 000 divers of all ages and abilities each year. 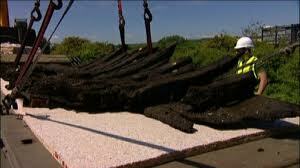 It is being used there to inspire and train the next generation of maritime archaeologists. Finds from the ship will constitute one of the most important exhibits in a new – overground – museum in Southend, currently still under construction, and scheduled for completion in 2018. (The “Prittlewell Prince” will also be on exhibit there). This entry was posted in 16th century London, Maritime London, River Thames, Tudor and tagged Cherabin, Gresham Ship, Gustav Milne, Museum of London, Thomas Gresham on May 6, 2014 by Bob Jones - The Lost City of London.